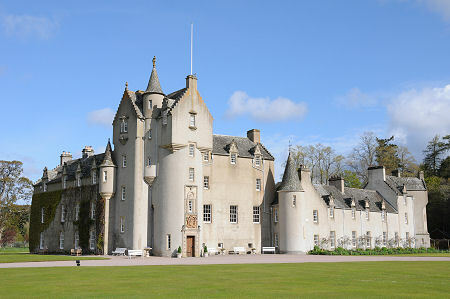 Ballindalloch Castle stands on the south east side of the River Spey, close to the point where it is joined by the River Avon. For visitors heading into the heart of Speyside, the crossing over the River Avon is obvious, though views of the castle and its estate in the valley below are obscured by the screening woodland. 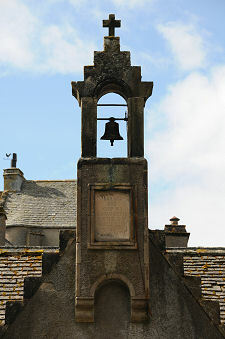 The entrance to the estate is well signposted from the A95 a little over half a mile north of its junction with the B9008 from Tomintoul. Note that this page covers the castle itself: we have a separate feature about the castle gardens and grounds. Scottish castles come in all shapes and sizes. Each has a story to tell, and each has its own unique character. Ballindalloch Castle may not be among the best known of Scottish castles, but from a visitor's point of view, it is a real superstar among them. It should certainly be on the "must see" list of anyone coming to Speyside, even if they are primarily in the area to tour the distilleries. Why do we like it so much? What really helps set it apart is the fact that since it was built, over four and a half centuries ago, it has been the family home of a single family, the Macpherson-Grants. Many Scottish castle fell on hard times and changed hands when leading members of their owning families made too many enemies in the 1560s; or in the turbulent decades in the middle of the 1600s; or backed the wrong side in one or more of the Jacobite uprisings between 1689 and 1745; or simply backed too many losing horses in the 1800s. The Macpherson-Grants avoided all such pitfalls, and as a result are still in residence. This background of continuity and stability, apparently combined with centuries of prudence and sound business management, make Ballindalloch Castle extremely unusual among Scottish castles in at least two respects. The first revolves around the exceptionally high standards of maintenance and attention to detail that are obvious from the moment you enter the grounds, and which only become more obvious when you visit the castle itself. Managing a castle and its estate must be a huge burden, and Ballindalloch Castle is cared for in a way that really does set it apart as something special. Associated with this is the way that the castle has been modernised and refurbished without undermining its integrity or its attractiveness. Perhaps the most telling example of this is the way the number of bedrooms has been reduced to allow the provision of opulent en suite bathrooms. The result is that those staying here on exclusive use packages can enjoy all the character and charm of a castle, without any compromise on the luxuries you'd expect in the most upmarket of hotels. A third factor adding to the enjoyment of the visitor is the sense that this is indeed a real, contemporary, and living family home, something made very obvious by the pictures and mementos on display in many rooms. 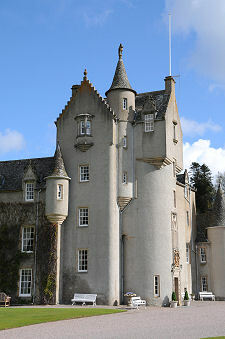 The origins of Ballindalloch Castle date back to the building by the Grants of Ballindalloch of a traditional Z-plan defensive tower house at some point in the first half of the 1500s. A stone lintel above the fireplace in one of the bedrooms carries the date 1546, and this is taken as the most probable date for the construction. There is a story that the original plans for the castle would have seen it built in a better defensive location on a hill to the south, and that a start was made on building it there. But every night the construction work was undone by some invisible hand and the Laird of Ballindalloch then heard a voice telling him to "build it in the coo-haugh" (or cow meadow). The original site, where it is said foundations are still visible, was abandoned and the tower house was built where it still stands today, at the heart of the larger castle that has since evolved. 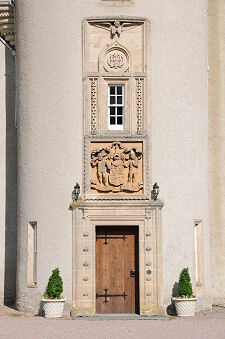 The first record of major development of the original tower house comes in 1602, when a grand front entrance was added, topped off by a magnificent frontispiece or armorial panel above the main door. This remains the main external decorative feature of the castle today. Ballindalloch Castle was attacked and burned by James Graham, 1st Marquess of Montrose and his Royalists in 1645, and subsequently repaired. A notable resident of Ballindalloch Castle was Major General James Grant. He was born here in 1720 before going on to carve out an impressive career, first as an army officer during the French and Indian War and the Anglo-Cherokee War. He then took part in the capture of Havana from the Spanish, before becoming Governor of East Florida in 1763. He later fought in the American War of Independence. Back in Scotland he became MP for Tain Burghs, and in 1789 was made Governor of Stirling Castle and Commanding General of the Army in Scotland. In 1770 General Grant commissioned the building of two new wings at Ballindalloch Castle: the south wing which extends the frontage east from the tower house, and a north wing, said to have been built specifically to house his French chef. On his death in 1806, General Grant was succeeded by his grand-nephew, George Macpherson of Invereshie. In 1838 he became Sir George Macpherson-Grant, 1st Baronet of Ballindalloch. As the first "Macpherson-Grant" he effectively linked the two most significant clans of Speyside. The 2nd Baronet, Sir John Macpherson-Grant extensively remodelled Ballindalloch Castle in 1850, building ranges surrounding a courtyard to the north of the existing building. The 3rd Baronet, Sir George, added a further wing in 1878. This was demolished by the 6th Baronet in 1965 "much to the improvement of the appearance of the building" according to the guidebook, and Sir George is perhaps better remembered for founding, in 1860, the Ballindalloch herd of Aberdeen Angus cattle. This is the oldest in the world and it continues to thrive on the estate today. The 1965 renovations included increasing the number of bathrooms in the castle from one to six, and since the present Laird of Ballindalloch, Mrs Macpherson-Grant Russell, inherited the estate in 1978, she and her family have continued to renovated the interior and exterior of the castle. Having parked to the rear of the castle, visitors make their way around to the main entrance. See our separate feature about the castle gardens and grounds. En route they pass the excellent tea room and tastefully stocked shop. Beyond the front door is the entrance hall, complete with a highly decorated vaulted ceiling, springing from a central pillar added in 1850. From the entrance hall you pass along the wing extending north which was built in 1770. This brings you first to the drawing room. This room sets the theme for much of the remainder of the castle. What you find is a beautifully proportioned space which, though by no means small, is on a scale which still feels comfortable. Much of the furniture is roughly contemporary with the room itself, though some was added in the 1800s. Making a well matched pair with the drawing room is the next room you pass through, the laird's smoking room. Here the laird and gentleman guests would retire after dinner for a cigar and a dram. Much of the china on view dates back to 1770. The next room on your tour is the library. This was panelled and refurbished in 1850 and is home to the family's collection of some 2,500 volumes. It is impossible to stand in the library of a living home such as this one and not wonder where the family keep the John le Carrés and day to day reading matter. By any standards this is a remarkable room, though one it is perhaps better not to imagine having to dust to the superb standards of housekeeping in evidence throughout the castle. In a slight interruption to the expected flow, the next room is Lady Macpherson-Grant's Room. The centrepiece to this stunning room is a four poster bed dating back to about 1860. 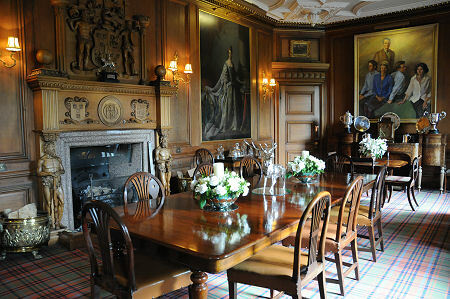 The dining room at Ballindalloch is the largest room in the castle, and started out as its great hall. As originally built in the 1500s, small windows and stone floors would perhaps have been softened somewhat by wall hangings. What you see today is very different and dates back to the changes made in 1850. The wall panelling is of American pine, while the magnificent ceiling is modelled on, possibly even cast from, a ceiling in Craigievar Castle in Aberdeenshire. There is much to admire in the dining room, though for us the highlight is probably the fireplace. This is flanked by figures representing those on the family coat of arms, which itself appears above the fireplace. Worthy of translation is the Macpherson family motto: "Touch not the Cat Bot a Glove", which very roughly means "don't mess with us without your gloves on". Flanking the fireplace are large paintings by Allan Ramsay of King George III and Queen Charlotte, presented to General James Grant in recognition of his military service. An occasional resident of the dining room, though sadly not when we visited, is the "Green Lady", one of at least two benign ghosts thought by some to reside in different parts of the castle. Another is sometimes encountered in the Pink Tower, one of the bedrooms, reclining in an armchair. This "beautiful lady" is said to be the current laird's guardian angel. The nursery at Ballindalloch is high in the original tower, and before you ask, like we did, why it is in such an inaccessible location, it was never originally in this room. Rather what you see here is a representation of the lives of the children of the household from the late 1700s until modern times. Carrying on up the spiral staircase brings you to the Highland Tower, a watch tower or caphouse sitting on top of the original tower house. Here you find a servant's bedroom complete with a remarkably compact bed, and a room in which aspects of the history of the castle are on display. Back on the ground floor, a corridor from the hall is home to a number of further displays housing more family mementos and telling the stories of some of those who have lived here. Perhaps most impressive is the large display of the many medals awarded to members of the family over the centuries for their military service.